I was making such a mess of things because seeing and thinking properly cannot be done while upset. 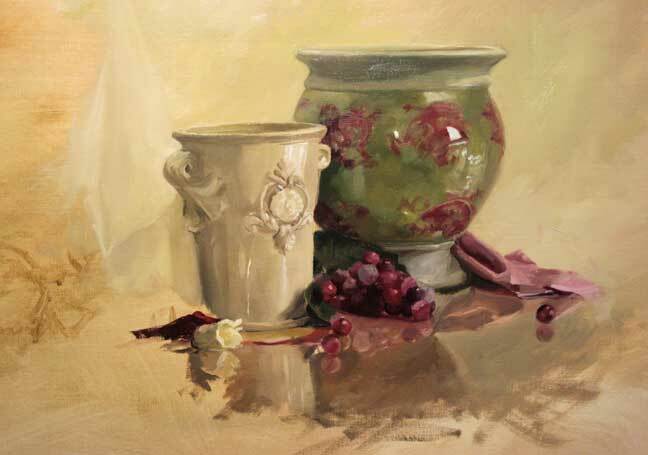 So I had to leave the painting and still life alone for a few days. I had more important things to do than to play with paint anyway, although my husband wants me to keep working because he knows painting this series will also help me to process everything. But now I am back at it. Things are looking up for now, my heart is beginning to heal and it seems that my painting skills have returned after not having painted in so long. I’m really looking forward to my next painting session so I can play with those roses. This entry was posted in Art and Emotions, Painting Progression and tagged grapes. Bookmark the permalink.